Laser hair replacement surgery involves removing a donor strip of scalp tissue containing hair follicles that are DHT-resistant. These follicles are typically removed from the back of the scalp. 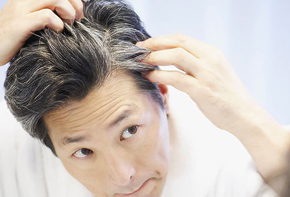 DHT is the hormone that builds up in the hair follicles and causes baldness where both men and women are concerned. The hair grafts used can be transplanted anywhere on the scalp or a person’s skin and there is minimal risk that they will fall out. The laser punches small holes in the balding areas of the scalp and the grafts are then transplanted into them. Your hair replacement surgeon will advise you of certain “do’s and don’ts” that you need to pay attention to once the surgery has been performed. Most importantly, you don’t want to wash your hair for up to 2 days and also make sure that there is no scratching of the scalp during this period. Try to avoid bumping or hitting your head as this can interrupt the growth of new hair. you are probably going to notice that some of the new follicles are falling out about 2 weeks after you have had the surgery. This is attributed to shock and is considered normal so there is no cause for alarm. At this two week point, you can start caring for your hair as normal since the replacement process is now completed. About 60 to 90 days down the road, you should start noticing significant re-growth and you should not be able to distinguish the difference between your existing hair and the new growth. Following your physician’s advice precautions is very important if you want a successful outcome. Infections occasionally occur and your physician can prescribe medications to take care of this. Scabbing is also normal. Leave the scabs alone and let them fall off naturally.